The winner of this year’s George Braithwaite Scholarship Award began her career in social services as a Service Coordinator, and shortly afterward became a Residential Manager overseeing 24hr. supervised homes for children. Anyone who knows her can attest to her passion for the people she provides support to, and this led to the creation of the Associate Family Home Program – where children and young adults enjoy a quality of life in a loving and caring family environment. She was also instrumental in creating expansions to ensure people could return to their community during the facility closures. In 2009, she was offered a Deputy Executive Director’s position at Community Living Newmarket/Aurora, and a few months later became the Executive Director. 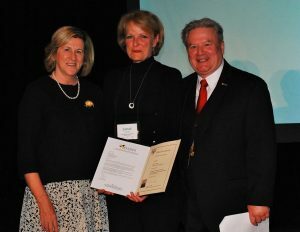 In 2012 she accepted an Executive Director position at Community Living Oakville, which she proudly holds to this day. She works tirelessly to further contribute towards the mission and vision of the organization, while establishing a path with clear and measurable results. Under her leadership, the organization has gained financial strength and a culture that is conducive to collaboration and a strong work ethic where the people who have a developmental disability are on a journey to reaching their full potential.